WP Funnel Delivery Magic is a powerful WordPress plugin that allows your customers the opportunity to purchase the added upsells which they didn’t get around to buying the first time. What makes this plugin so powerful and unique is that it identifies what the customer purchased prior and markets one-time-offers to them. 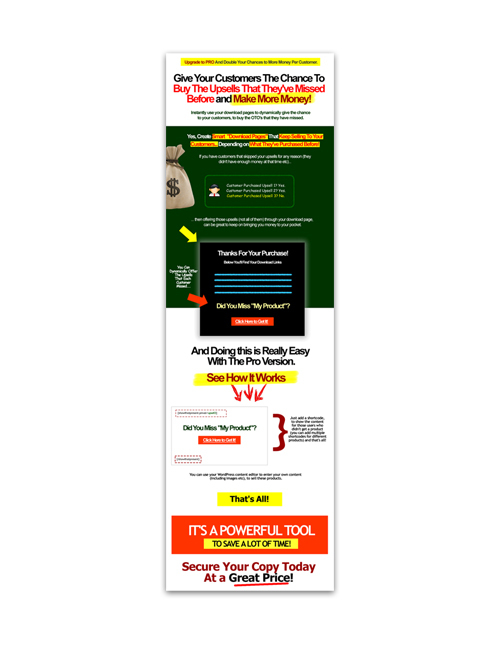 These are smart download pages which will help you to make even more money. In the online marketing world, expert marketers know the importance of getting eyes on their products but many times customers might be hesitant initially which means the marketer may lose the sale. This plugin helps to ensure the customer isn’t gone forever. The upsells and one-time-offers have proven to add a ton of additional money on top of the original offer. It’s a method of marketing that simply works as the buyer is already in buying mode and there’s a 50/50 chance they might buy again. This type of marketing is used often by business and companies both online and in retail. You can see the WP Funnel Delivery Magic Pro sample download page for yourself. It’s a great one so hit the button and grab it now.